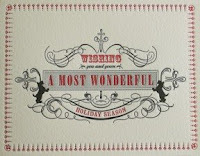 Well, the holiday greeting cards have started arriving in our charmed mailbox (who are you organized people?! ), and it seems like it's time for us to get cracking on ours. 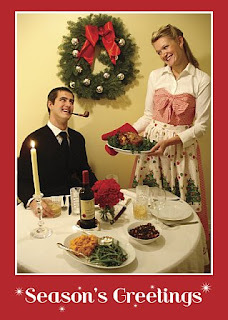 Here is our card from last year (my profile photo at right is one of the out-takes). We print ours using Kodak Gallery (and you can get 20% off using the code HOLIDAYGREEN at checkout), but for those less photographically inclined, I found some sweet pre-printed cards from my favorite vendors. This cute car design is from iomoi. Everything they do is fully customizable with your own message (and they have the cutest matching address labels). 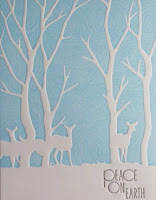 This deer card and swirly letterpress design are both from elum press. Their cards are all printed by hand and super creative. I've always loved the super-simple single-color letterpress cards from Carrot and Stick Press. They have tons of cute designs and colors (including these snowflake and bow cards) and they make matching seating cards (for your holiday dinner table) that are the sweetest. 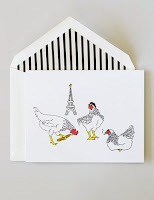 This "Three French Hens" card from Kate Spade is pretty charming (they are eating baguettes and wearing berets by the Eiffel Tower). The inside reads "...and a partridge in a pear tree". It's available from Kate's Paperie. 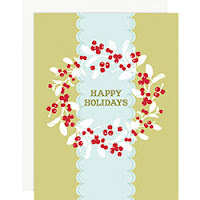 This wreath card and gumdrop card are both from Papersource. Cuteness. You should do the exact same card you did last year but this time with signs of the bad economy: tattered clothes, ripped table cloth, a mcdonalds meal, etc. 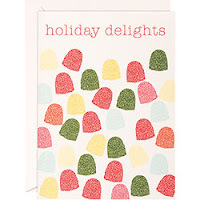 goddess of charming domestic life: what is the rule of thumb on how long before christmas a domestic goddess should try to officially begin the process of sending out holiday cards (factoring in how long it takes to get them printed, shipped to your home, etc)?? and when, ideally, should they arrive at the domiciles of lucky friends?